Take a workshops from dance legends & famous choreographers! See battles of the best freestylers & national teams of the world! Enjoy parties & jams with the best dancers from all around the world Experience your best streetdance days! Come to SDK EUROPE!!! WHY YOU SHOULD BE PART OF SDK.EUROPE? The biggest summer international dance community gathering in Europe!!! The largest educational street dance festival in Europe!!! A unique and the best chance to improve your dance skills, confront with the others and let yourself grow surrounded by the global community at SDK!!! New SDK place – a modern and clean natural aquatic center RIVIÉRA with stainless steel pools and great services – admission for the whole week included in the price!!! FESTIVAL with a wonderful atmosphere – who has already been there can confirm 🙂 – the best all-week-long dance party you’ll ever experience in your life where the energy of street dance and dance music lovers and friends from up to 50 countries from around the World connects within our great community and our lifestyle!!! For the first time comfortable accommodation for the best possible price in the city close to the nature zone (max. 10 – 20 min. on foot), and an area to build your tents right next to the aqua park + exclusive lunch and supper option right in the camp!!! SDK JUNIOR – a camp with supervision + additional activities for juniors!!! One of the main news!!! A unique international REDBULL project DANCE YOUR STYLE will be a part of SDK!! For the first time in CZ!! All this in one package for a fantastic price!! 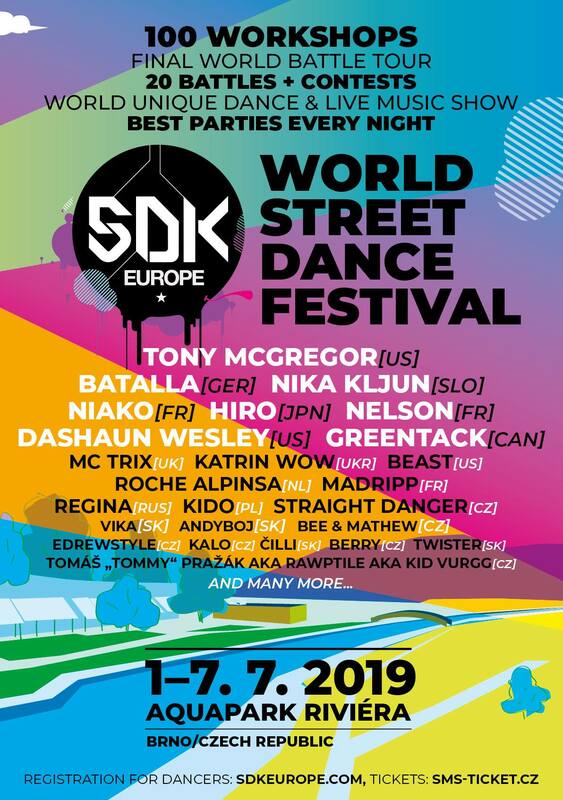 SDK IS THE BIGGEST AND THE BEST SUMMER GATHERING OF STREET DANCERS IN EUROPE!! YOU CANNOT MISS A SINGLE DAY!!! SDK will provide you with an inspiration, improvement, education, confrontation, dance skillz, choreographies. The Camp will fill you with an inspiration for a long time ahead!!! :) We have workshops for all levels from intermediate to professional dancers. If you’ve never danced, SDK is a great opportunity to combine experience and entertainment, music, movement and getting lots of new friends in a beautiful environment in Jedovnice near Brno.